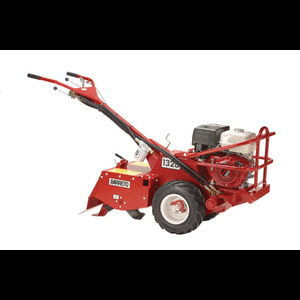 HEAVY WEIGHT SELF PROPELLED REAR TINE TILLER WITH HYDRALLIC POWER TO BOTH TINES AND TIRES. WORKS WELL IN GARDENS OR COMPLETE LAWN RENOVATION. VARIABLE TINE AND GROUND SPEED ALLOW OPTIMUM TILLING OPERATION IN ANY SOIL CONDITION. SUITABLE FOR SODCOVERED OR HARDENED SOIL CONDITIONS WITH SINGLE OR MULTIPLE PASSES. WEIGHT: 540 LBS WHEEL WIDTH: 20"
* Please call us for any questions on our tiller 13 16hp barreto rear tine hyd rentals in Portland OR, Gresham OR, Milwaukee OR, and surrounding metro area.